I love cooking chicken wings. 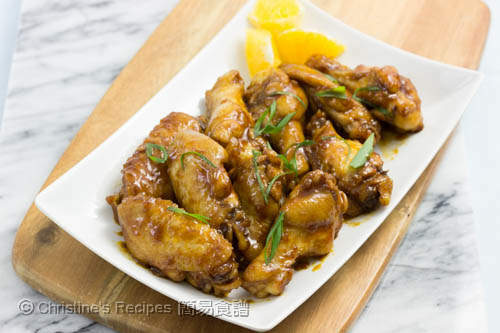 If you click to browse the recipe index, you’ll find many chicken wing dishes already posted on this blog. 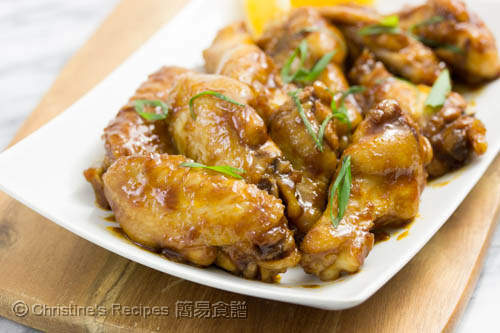 What I love about cooking wings is that they can be turned into many tasty dishes without any difficulty. My family is quite obsessed with chicken wings. If I add some more sauces, such as Sriracha sauce, the family would definitely love every bit of the dish. The mild hot taste of Sriracha works like a charm and makes the family wants more. The other day I experimented with adding some orange zest and juice to cook wings with Sriracha sauce. Oh my goodness, they're so absolutely finger-licking good. The fragrance and sweetness of orange took the whole dish up a notch. The wings were cooked until tender and absorbed all the flavours of the hot chilli sauce and seasonings. Another thing that I didn’t expect was that the orange fragrance drew everyone in the house to want dinner instantly. 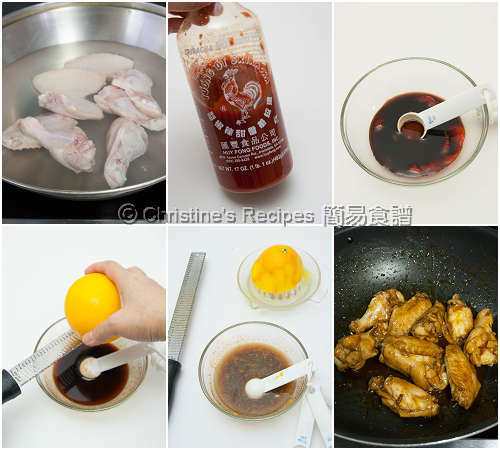 Chop the chicken wings and blanch in boiling water for about 3 minutes to remove any blood and impurities. Drain well. Set aside. Combine all the seasonings. Place in a wok. Add garlic and chicken wings. Bring to a boil. Reduce heat to medium and cook with a lid on until the wings are done. Remove the lid. Increase heat to high. Continue to cook until the sauce reduced to thicken to your liking. Serve immediately. Sriracha is a kind of mild chilli sauce, available at Asian grocers. I used the brand, Huy Fong Foods, with a rooster on the bottle. If you like hottest taste, feel free to add more of it. To get the best results, taste the orange to make sure it’s sweet enough before cooking with chicken wings. Oh my Christine...will have to try this one out. 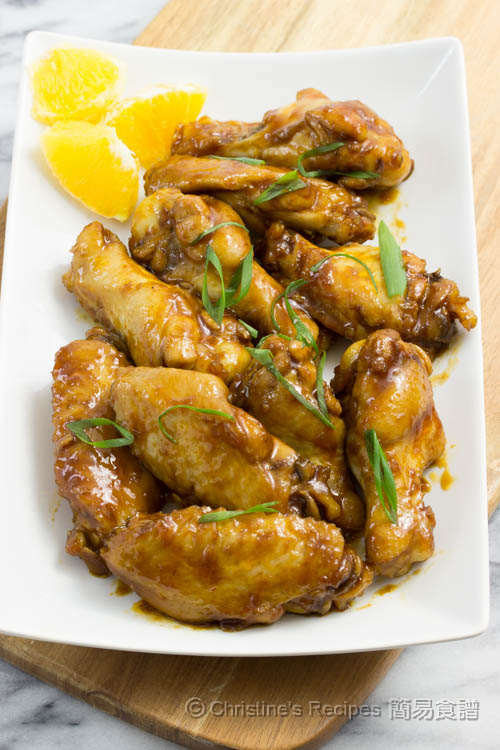 I will have to get the vinegar as that is all I am missing - love wings especially the tips are my favorite part so will be keeping those in for the recipe when I do them. Love the site and all the great recipes, found you through Face Book just a while back. Thanks for sharing your great recipes.. They look fingerlickingly delicious! Love that sauce! My boss introduced this site to me for trying a new dish. i must try this one..
Hi Christine! Just to confirm, do you mean one clove of garlic or one whole entire garlic? Thanks! It's one clove of garlic. Wonderful aroma of garlic. I love it. Thanks for letting me know you had a big success. Hi Christine I was wondering if I could use drumsticks instead ? Drumsticks will work too. They need a bit longer cooking time though.